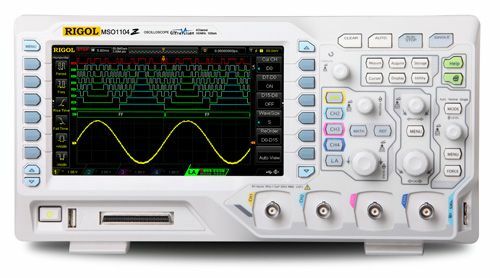 Specs: 70 MHz Mixed Signal Digital Oscilloscope with 4 analog channels as well as 16 digital logic channels plus 12 Mpt memory and 1 GSa/sec sampling rate. Do not measure grounded circuits unless you know what you're doing. That usually means that any AC signal from the wall is a no-no. Our DC supplies and cellphone chargers should be okay. The scope is earth-grounded, which means that if you clip the ground lead of a probe to a portion of AC that is not grounded, then you will cause significant and irreversible damage to the scope or probe or both. Do not take the front hook of the oscilloscope probes off. If you need to measure a breadboard, clip onto a small jumper and plug the wire into the breadboard. If you cannot definitively say, “The inductance of this wire is preventing me from properly measuring this waveform”, then you can use a jumper without affecting your measurements. I say this because I've seen people pull off the cover and try to jam the needle of the probes into breadboard sockets, and that's not what they're designed for and damage them, like, every time. Coil up the probes carefully and place them on top of / behind the scope when you're done. They are expensive and delicate precision coaxial cables and should be treated accordingly. Turn off the scope when you're done with it. Electronic components have limited lifetime and go out of calibration, etc. It's cool to keep it on for a few hours when you're debugging a difficult project or whatever, just turn it off when you leave. If you see someone treating the scope without the respect appropriate for a $1000 tool, take that as an opportunity to educate them in the nicest way possible, because there's no malice on their part. Everybody has to learn somehow.